We offer our client an excellent quality range of Discover Bike Indicator, which are manufactured from high grade quality raw materials. 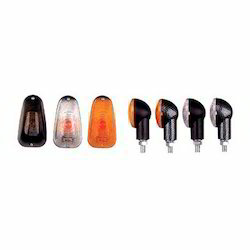 These Indicators can be customized as per our precious customers specifications. These Indicators are widely known for its durability and quality. 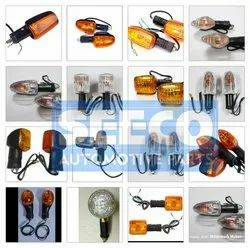 Exporter of two wheeler indicators & blinkers from India. We Provide quality Products at a very competitive prices and as per your requirements. We have emerged as the foremost manufacturer and supplier of Splendor Bike Indicator. Our range is widely appreciated by our clients which are situated all round the nation. We offer our range of Splender Bike Indicator at most affordable prices. We are a trademark provider of Blinkers For TVS Apache which is manufactured by use of top grade material and is widely demanded. Owing to massive industrial knowledge in this industry, we are involved in offering a wide collection of Bike indicator to our clients. - Passion Pro & Passion Plus. - Colors - White and Yellow. - Price Range - 36-38 Rs/Pair.